Outside Paris, where his most famous paintings remain in the Louvre and his spectacular murals can be seen in the Church of Saint-Sulpice, Delacroix’s work is hard to find. This book is the catalogue for an exhibition with the same title, which brings a selection of Delacroix’s wonderful paintings, together with others, to Minneapolis and London over the next few months (details below). The exhibition and book contend that, even though we may be hard pressed to see Delacroix’s paintings, we see his influence in much of nineteenth and twentieth century art: works by Monet, Degas, Cézanne, Odilon Redon, even Matisse. In this quest, Patrick Noon’s opening essay, ‘What is Delacroix?’, provides an insightful summary of his career, life, and key influences, illustrated by most of his most famous paintings, and brought to life with quotations from other artists and critics. Sadly the crucial murals have suffered the years quite poorly, and are desperately difficult to capture well in photographs. The second essay, by Christopher Riopelle, starts with Delacroix’s death in 1863, and proposes those artists and works which he influenced, as reflection of his posthumous fame. The first cited is perhaps inevitably Fantin-Latour’s Hommage à Delacroix (1864), in which the portrait of Delacroix turns out to be a painting of a photograph. Riopelle moves on to consider modern decorative painting, such as Delacroix’s work in the Galerie d’Apollon in the Louvre, a topic which will be unfamiliar to most readers, and is again sadly limited by the difficulty of illustration. It is when he considers Cézanne and Gauguin that I start to have problems. Whilst I understand Cézanne’s attempts at allegorical painting, Riopelle repeats Cachin’s bizarre claim that Cézanne’s The Eternal Feminine (1877) is ‘a sarcastic version of Delacroix’s Death of Sardanapalus’. 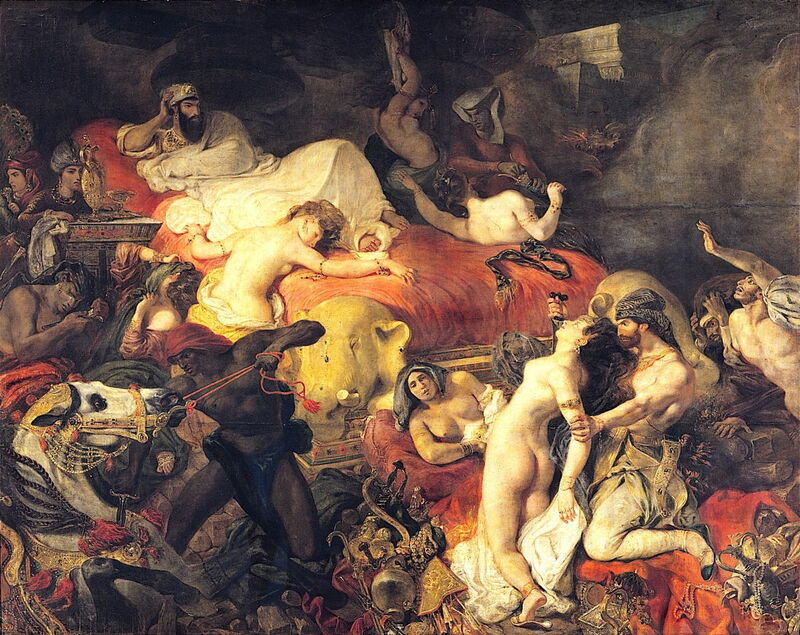 Eugène Delacroix (1798–1863), The Death of Sardanapalus (1827), oil on canvas, 392 x 496 cm, Musée du Louvre, Paris. Wikimedia Commons. Although this exhibition has to make do with a reduced replica of the latter painting, I am afraid that I can see almost nothing in common between the Cézanne and Delacroix’s powerful masterwork, and the account given by Riopelle, presumably from Cachin, reads as over-contrived and out of context with other early paintings by Cézanne, including some that are in this exhibition. Perhaps I need to see the paintings side by side for myself. Riopelle’s well-illustrated comparisons of details from paintings by Gauguin and Redon are much more convincing, though. I also run into difficulties with Riopelle’s account of how Signac claimed that Delacroix used colour ‘scientifically’, which I feel merits a little chronological rigour. Signac’s writings on Delacroix started to appear just before the end of the nineteenth century, seven years after the death of Georges Seurat, and 35 years after the death of Delacroix. Chevreul’s book on simultaneous colour contrast was first published in French in 1839, but the main body of work by von Helmholtz was not available in French until well after 1863, and Ogden Rood’s writings did not appear in French until 1881. Furthermore Delacroix’s journal, which was undoubtedly a major influence on many artists, was not published until 1893. It is generally agreed that Delacroix was the finest colourist of his time, but to attribute to him a scientific approach to colour (whatever that might mean), or any achievements in colour theory, appears to lack evidence and conflict with chronology. However there were many other reasons – which Riopelle does not consider – for Signac wanting to claim some legacy from Delacroix, particularly once the Neo-Impressionist movement had lost its chief architect, exponent, and theoretician. After those opening essays, the remainder of the book is the catalogue proper, which is divided into four sections: Emulation, Orientalism, Narrative Painting, and Delacroix’s Legacy. Emulation should have been a straightforward gathering of copies made of Delacroix’s works, but strays a little with Manet’s Music in the Tuileries Gardens (1862), and in most cases only includes the copy and not the original. There are two spectacular exceptions, in oil sketches by Delacroix for murals which should prove highlights of the exhibition. Orientalism is a curious misnomer, as Delacroix’s was gained from Algiers in North Africa, which is of course little further east than Paris. Here are some of the finest works, both of Delacroix and the book/exhibition, although perhaps not unexpectedly the Louvre did not part with the full-sized Death of Sardanapalus, and we here have to make do with a small replica. Eugène Delacroix (1798–1863), Women of Algiers in their Apartment (1834), oil on canvas, 180 x 229 cm, Musée du Louvre, Paris. Wikimedia Commons. Two Cézannes stand out in incongruity: The Eternal Feminine (1877) and The Battle of Love (1880), neither of which appears in the same league. 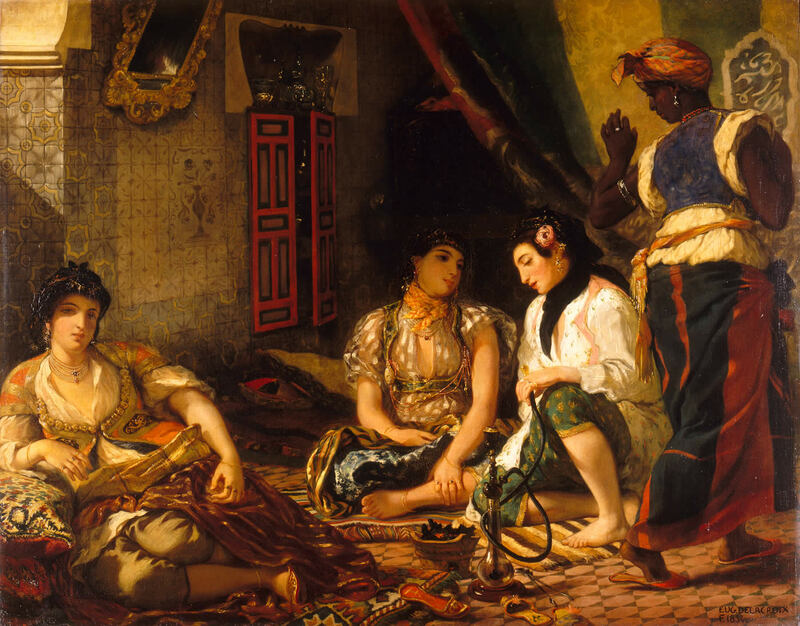 The Montpellier version of Delacroix’s Women of Algiers in their Apartment (1847-9) is shown, which prefers chiaroscuro to the bright colours of the earlier (1834) Louvre version (illustrated, but not in the exhibition). Delacroix’s splendid Bathers (1854) is paired against Cézanne’s early and impoverished Bathers (1874). I did not notice any mention of the fact that, in the latter half of the nineteenth century, this ‘orientalism’ was replaced by ‘Japonisme’, which is entirely absent from Delacroix’s work. Narrative Painting at a Crossroads, ‘Truth in Art’, starts with a comparison of religious works, including one of Delacroix’s Christ on the Sea of Galilee (1853), which includes a short discussion about its colour contrasts, and their influence on Vincent van Gogh. This is well-matched against Odilon Redon’s The Red Barque (1895), one of his ‘barques mystiques’ from that period. The peculiarity here is that Redon misses Delacroix’s colour contrasts completely, although that is not commented on in the text. Theme and cohesion take another turn for the worse when we are confronted by Cézanne’s grotesque and disturbing The Abduction (1867), and we drift off with Degas’ Young Spartans Exercising (1860), another early work exploring areas which the artist thankfully abandoned. The narrative gets back on track with the sole painting by Richard Parkes Bonington, A Knight and a Page (1826), which is puzzling given the fact that Bonington and Delacroix shared a studio for some months, and Delacroix was so influenced by him. Knightly exploits are illustrated further, but once again this exhibition includes but a sketch for The Battle of Poitiers (1830), and not the finished work. The final section of the catalogue is either its most eclectic or its most disparate, according to your point of view. Apart from a slightly more coherent collection of pleasant but hardly momentous floral still lifes, including two rather lovely paintings by Redon, these seem an almost random sample – except for landscapes. 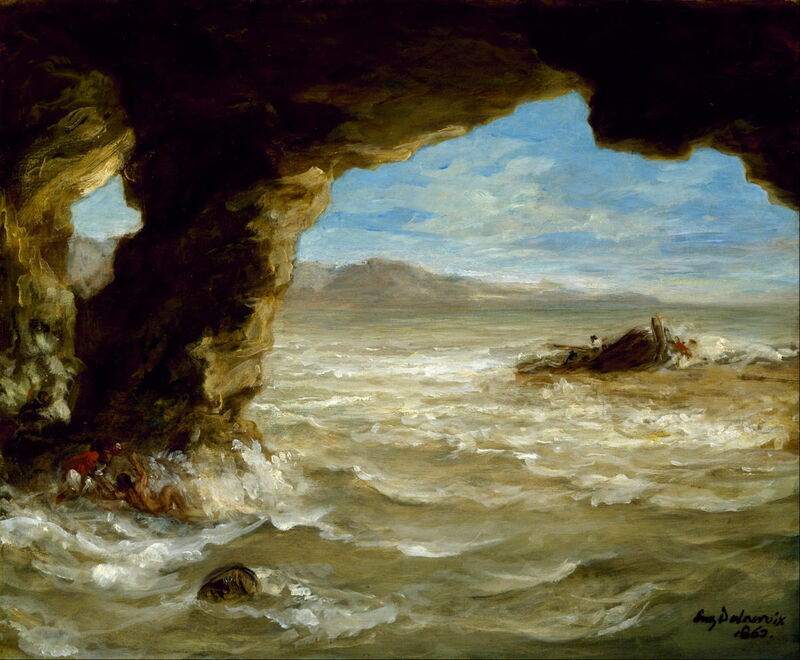 Although Delacroix is not well known for his landscapes, here is another jewel which makes this exhibition compelling: his Shipwreck off a Coast (1862), which is paired with a near-contemporary Monet (which differs in Minneapolis and London), although not with Delacroix’s earlier The Sea at Dieppe (1852), another which remains locked in the Louvre. With those goes Cézanne’s lacklustre River Landscape (1881), one of his most flawed paintings, and an out-of-place Signac snowscape. I then lost the thread completely with a raucously-coloured barely-representational Kandinsky, and two Matisses. End matter consists of a good bibliography, and a single consolidated index which is not as easy to use as it should be, but fairly comprehensive. 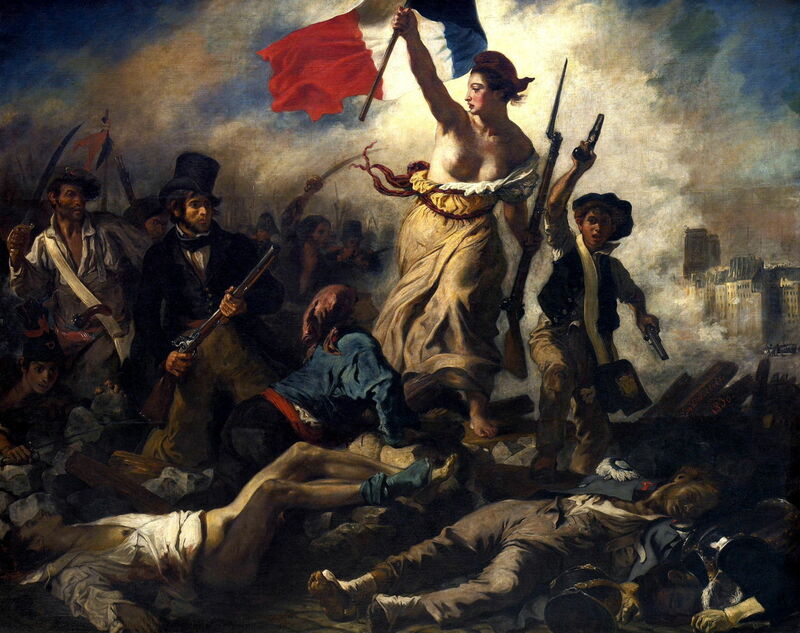 There can be no doubt that Delacroix was a major figure in nineteenth century French painting, and that many of the later French artists considered him very important, and a major painter. His paintings were also copied by most of the Impressionists during their training. But that is not to say that Delacroix was actually a major influence on the Impressionists or their contemporaries. The evidence presented in this book of influence is not as strong as I would have liked. As a result I think it is at risk of falling into the trap which I suspect Signac did. However, this book and its exhibition are rare chances to get to see these paintings, and perhaps overcome my scepticism. I hope to report back early next year. The exhibition of the same title opened at the Minneapolis Institute of Art on 18 October 2015, and runs there until 10 January 2016. It then moves to open at the National Gallery, London, on 17 February 2016, and closes there on 22 May 2016. Posted in General, Painting and tagged Bonington, Cézanne, Chevreul, Degas, Delacroix, Matisse, Monet, Ogden Rood, Redon, Signac, van Gogh, von Helmholtz. Bookmark the permalink.